These are wild asters, the kind that bloom along the roadsides in fall. 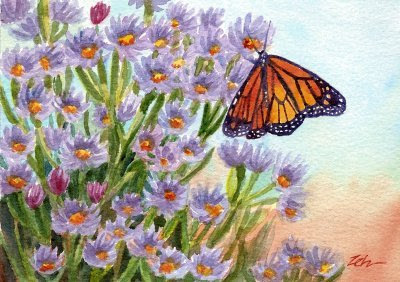 The monarch butterfly is stopping on its long journey south to take a few sips of nectar for much needed energy. I like the contrast of colors in this painting - purples, yellows, oranges and greens. You can imagine the butterfly slowly opening and closing its wings as it moves from one flower to another.